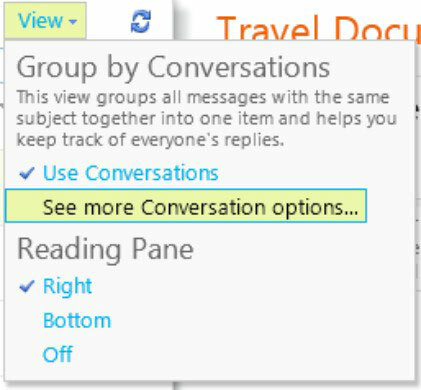 One of the most talked about new features of the new version of Outlook (desktop or online) is the conversation view. E-mail in Office 365 is powered by Exchange Online, the cloud version of the Exchange Server platform, the world’s leading e-mail server for business. The conversation view groups together all e-mails with the same subject line or topic into one item. You can then see everyone’s replies without hunting for related e-mails in the conversation thread. You can also see your own replies listed in the item. If you move e-mails into a different folder, they are still displayed in the item, including ones that have been deleted. You can also move the entire conversation with all the e-mails inside it into a different folder in one fell swoop by first collapsing the item so the individual e-mails are not displayed and then dragging and dropping the item into a folder. 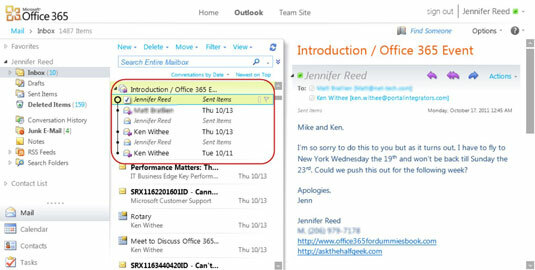 By default, Outlook displays your Inbox in the conversation view with the newest message on top. This view takes a little bit of getting used to, especially when you’ve been programmed to scan through e-mails in date order regardless of the subject line. It can be confusing to see an e-mail on top of the list on a subject that was discussed yesterday until you expand the conversation to see that there’s a new reply to the conversation. After you trained yourself to view e-mails by conversation rather than by date of receipt, you’ll quickly appreciate the timesaving feature this view offers. You can find more options for displaying e-mails in the conversation view. You can sort the messages displayed in the Reading Pane either by newest email on top or newest email at the bottom. When you expand the conversation list by clicking on the triangle to the left of the conversation, you can choose to match the sort order in the list with how the messages are displayed in the Reading pane or show the messages in a conversation tree. In addition, you can choose to hide the deleted items from the conversation list. To access these options, click the View link from the menu and then click See more conversation options.